Russian international midfielder Andrey Arshavin, whose contract is going to be over at the end of this season in June, will be leaving Arsenal as soon as the contract expires. The news has been confirmed by Arsenal Manager Arsene Wenger. Arshavin joined the club in 2009 on a four year contract from Russian club Zenit St Petersburg for a then record 15 million GBP deal. Over these four years, Arshavin showed some brilliant performances for the club. In 2009, Arshavin scored 4 goals against Liverpool to draw the game and earn 1 point for the club. In 2011, he scored the winner against Barcelona in Champions League quarter final played at Emirates Stadium. 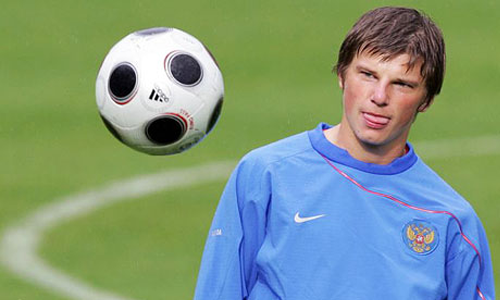 Off late, the chances of Arshavin to play for the club have been diminished as he was involved in very few games. Last year, he was transferred on loan to his former club and the club management has not shown any interest in renewing the contract and the decision about the future is entirely in his hands. Having said that, Arsene Wenger was all praise for the player, who had always put in 100% in practice as well as in the matches. Wenger described his presence as a source of inspiration and example for other players. He was always very dedicated and committed for what he was doing. Arshavin last appeared in a game for Arsenal on 20th January, 2013 against Chelsea in Barclays Premier League.